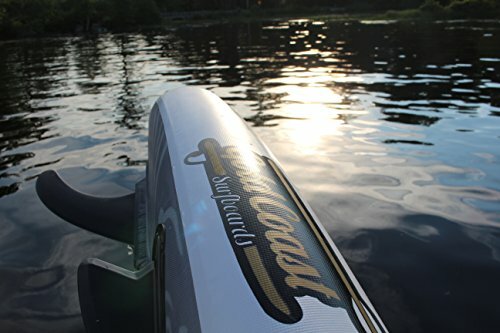 [SPECS]: This premium ISUP i s 10′ Feet 6″ Inches Long x 31″ Inches Wide x 6″ Inches Thick -||- Extremely stable & durable design -||- Great for all skill levels, the 10’6 Aqua Discover Paddle Board easily supports up to 350lbs – great for bringing gear or an extra friend for the paddle -||- This 10’6 Aqua Discover Inflatable SUP = The ultimate Inflatable Stand Up Paddle Board package for aquatic adventure on the go! [LONG LASTING DESIGN]: All 10’6 Aqua Discover Inflatable Paddle Boards are custom made with long lasting & light weight, Military Grade dual layer PVC material + High Density Drop-Stitch Core creating a stiff and easy to paddle Inflatable SUP -||- The 10’6 Aqua Discover ISUP Paddle Board is 6″ Thick – **DO NOT GO THINNER, boards are not as stiff when inflated -||- 2+1 Performance Fin Box System -||- Durable & Thick XL Wheeled Carrying Bag with extra room – travel approved! WHY THE 10’6 Aqua Discover ISUP? 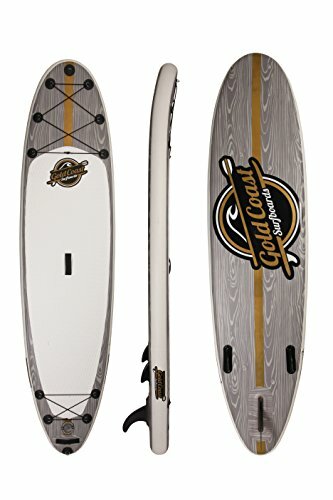 At 126″ long x 31″ wide x 6″ thick, this Inflatable Paddle Board is about high end design backed by long lasting performance. The Aqua discover features a beautiful Wood Grain design on both the Top Deck and Bottom Deck for all around visual appeal. The Wood Grain design on Top & Bottom makes your ISUP truly unique among all others. Stable, Strong, and incredibly easy to use, the Aqua Discover ISUP is the perfect portable SUP. 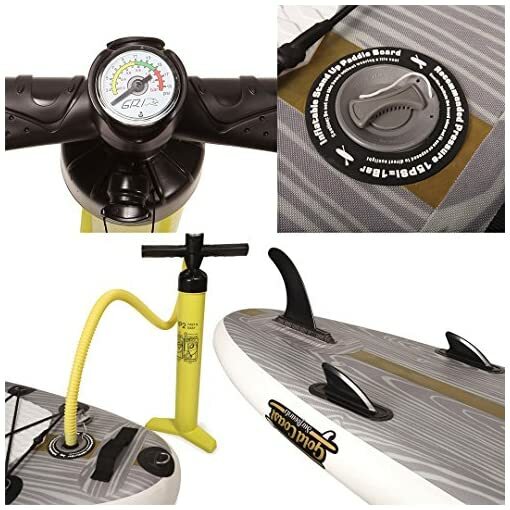 HIGH PERFORMANCE FEATURES – Rounded nose for enhanced tracking and better paddle glide, full rails throughout the entire board for increased stability and full usage of our flat diamond grooved textured deck while out on the water. Easily strap down your gear while you paddle out and have direct access your extras when needed. Easy carry SUP handle strap allows for easy inflated transport. 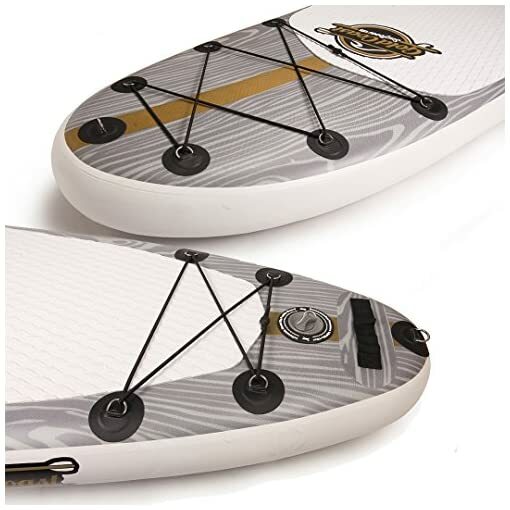 3 Fin system = Better Stability & Smoother paddling. DURABILITY – 2 YEAR WARRANTY – Buy With Confidence! -Covers everything outside of normal wear & tear. Made of Highly Durable & Lightweight Military-grade PVC material and multi-axis drop-stitch construction for a Rigid 6″ Thick and 31″ Wide ISUP built to last. Never worry again about dings and board cracks while you paddle away on your 10’6 Aqua Discover ISUP in all types of water conditions. 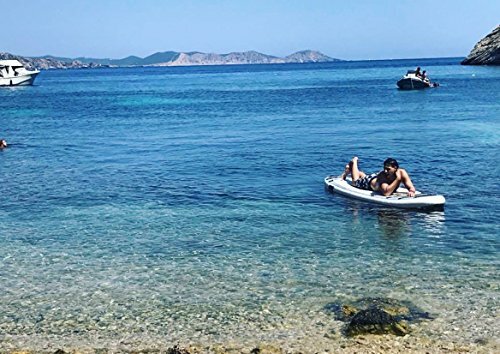 WHO IS THIS INFLATABLE PADDLE BOARD BEST FOR? – Anyone looking to make a one-time purchase on a Lightweight ISUP and not have to worry about getting a new one any time soon. Extremely Rigid, has a Weight limit of up to 350 lbs on the water. When properly inflated, the Aqua Discover is as stiff and rigid as your standard SUP! 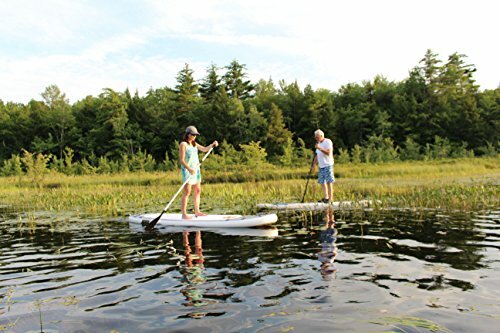 Great as an Ocean Paddle Board, Lake Paddle board, River Paddle board, pretty much any body of water you want to try and paddle on, this ISUP will do the trick! WHY THE 10’6 Aqua Discover ISUP? 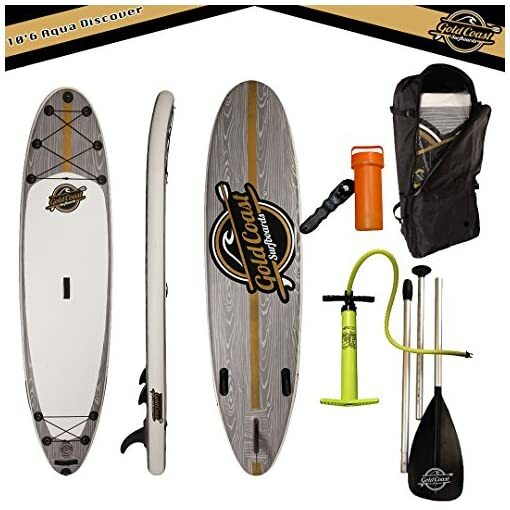 At 126″ long x 31″ wide x 6″ thick, this Inflatable Paddle Board is about high end design backed by long lasting performance. The Aqua discover features a beautiful Wood Grain design on both the Top Deck and Bottom Deck for all around visual appeal. The Wood Grain design on Top & Bottom makes your ISUP truly unique among all others. Stable, Strong, and incredibly easy to use, the Aqua Discover ISUP is the perfect portable SUP. 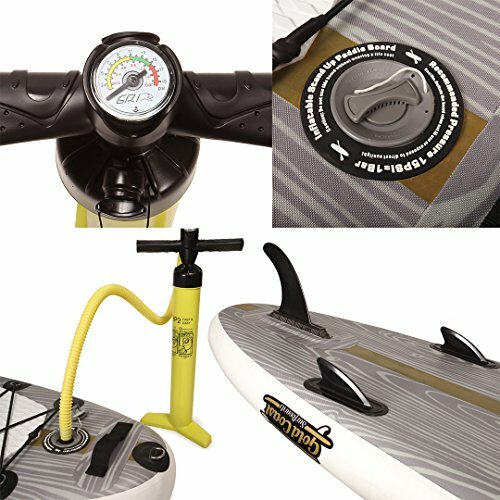 HIGH PERFORMANCE FEATURES – Rounded nose for enhanced tracking and better paddle glide, full rails throughout the entire board for increased stability and full usage of our flat diamond grooved textured deck while out on the water. Easily strap down your gear while you paddle out and have direct access your extras when needed. Easy carry SUP handle strap allows for easy inflated transport. 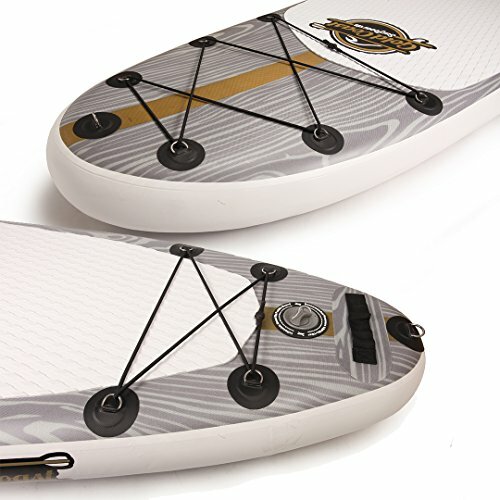 3 Fin system = Better Stability & Smoother paddling. DURABILITY – 2 YEAR WARRANTY – Buy With Confidence! -Covers everything outside of normal wear & tear. Made of Highly Durable & Lightweight Military-grade PVC material and multi-axis drop-stitch construction for a Rigid 6″ Thick and 31″ Wide ISUP built to last. Never worry again about dings and board cracks while you paddle away on your 10’6 Aqua Discover ISUP in all types of water conditions. 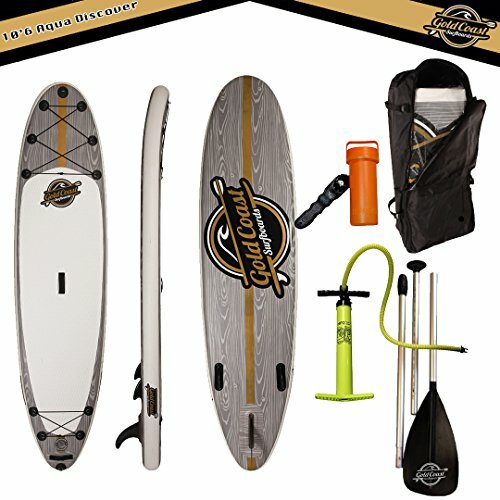 WHO IS THIS INFLATABLE PADDLE BOARD BEST FOR? – Anyone looking to make a one-time purchase on a Lightweight ISUP and not have to worry about getting a new one any time soon. Extremely Rigid, has a Weight limit of up to 350 lbs on the water. When properly inflated, the Aqua Discover is as stiff and rigid as your standard SUP! 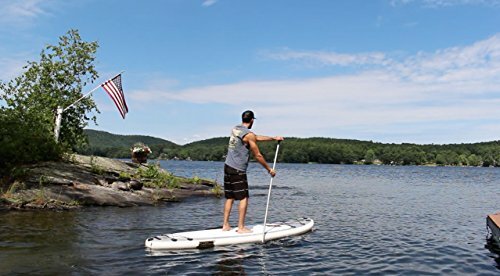 Great as an Ocean Paddle Board, Lake Paddle board, River Paddle board, pretty much any body of water you want to try and paddle on, this ISUP will do the trick!